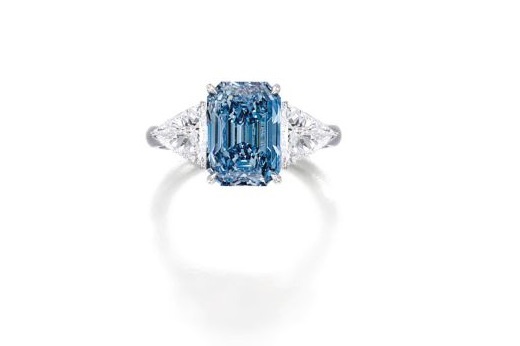 RAPAPORT... Sotheby’s failed to find a buyer for three blue diamonds at its Hong Kong auction Tuesday. A cut-cornered, rectangular step-cut, fancy-vivid blue, 3.32-carat diamond ring, valued at $5.9 million to $7.6 million, was left unsold. The center stone was set between two trilliant-cut diamonds. Two cut-cornered, rectangular, modified brilliant-cut stones also failed to attract a buyer at the Magnificent Jewels and Jadeite sale. One was a 2.56-carat stone surrounded by pink diamonds, with a presale estimate of $2.7 million to $3.6 million. The other was a fancy-vivid green-blue diamond set in a floral design, which was estimated at $789,900 to $891,830. Sotheby’s had not responded to a request for comment from Rapaport News at press time. The sale brought in a total of HKD 313.8 million ($40 million), with an oval, 88.22-carat, D-color, flawless diamond fetching $13.8 million.